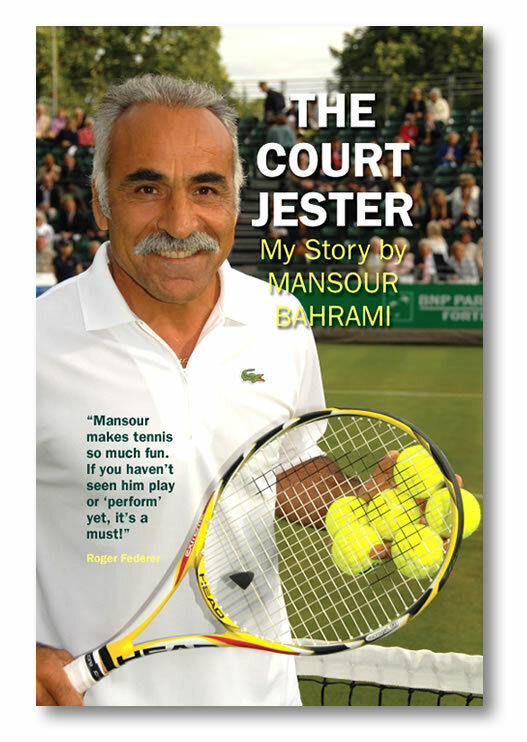 Published for the first time in English, Mansour Bahrami’s story of his extraordinary life is in turns inspirational, poignant and humorous. He also tells us of his friendship with Borg, McEnroe, Connors, Nastase, Leconte, Noah and many more professional tennis players on the circuit. THE COURT JESTER takes us into another world and begins by telling us of Bahrami’s amazing childhood in Tehran when he began playing tennis with a broomstick handle at the bottom of an empty swimming pool. In his early twenties, he was on the verge of entering topflight tennis when Ayatollah Khomeini ousted the Shah and swept to power. Tennis was immediately banned throughout Iran and international travel severely limited. Against all the odds, Mansour Bahrami ended up in the Doubles Final of the French Open many years later after overcoming seemingly insuperable obstacles in the way of a young, stateless player. Despite, or maybe because of his plight, his escapades both on and off the court make for exceptionally entertaining reading. Mansour is one of the leading names on the Seniors International Tennis Circuit: with his gift of showmanship, his special athletic talent and his famous trick shots, he is instantly recognisable to tennis fans everywhere. Original Paperback (6×9 inches), 186 pages, 50 black and white photographs.